Above photo taken at 'The Hooded Man 30th Anniversary Convention' (May 2014). 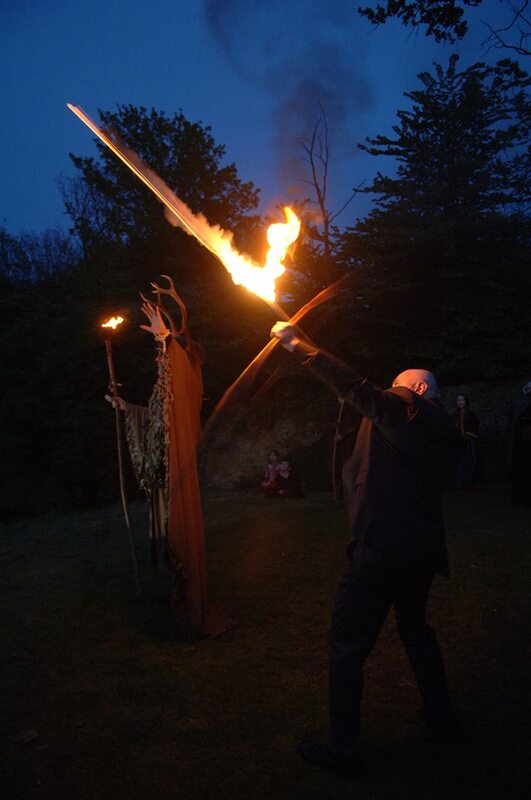 Mark Ryan fires a flaming arrow into the lake, in honour of Richard 'Kip' Carpenter. Courtesy of Bowlore. Photo (c) HoodedManEvents and taken by Robin Prichard. Your tickets cover the entire weekend (Interview Panels, live Entertainment, Saturday Evening Banquet, Convention Booklet, some Free Autographs, etc) but unfortunately not accommodation. However, an exclusive Discount Code will be available for booking direct with the venue and any room booking will include breakfast. Your ticket contract, which you sign and return, acts as your actual ticket - once it has been returned, you get entered on a Register to be ticked off on the morning of the event when everyone checks in. 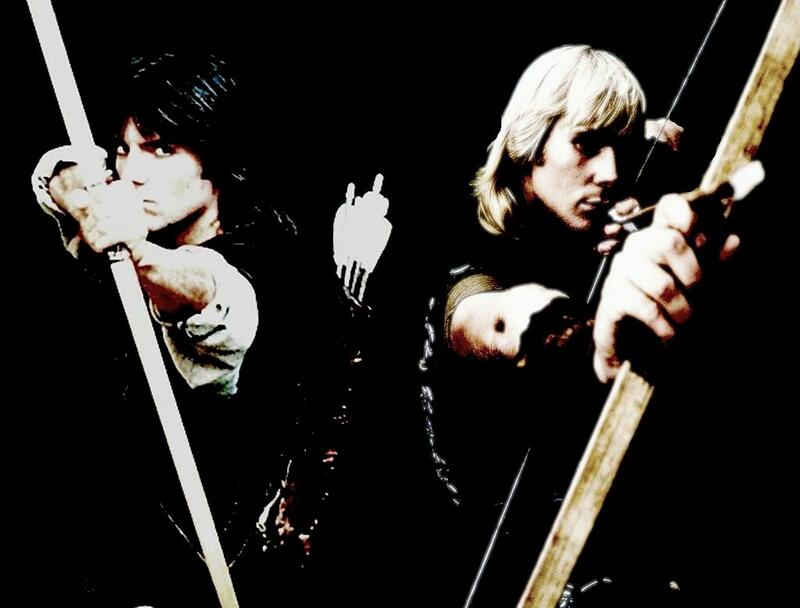 'Hooded Man Events' is a non-profit making venture, set up specifically to run 'Robin of Sherwood' conventions (created/organised by Barnaby Eaton-Jones), with all respective copyright maintained by the companies/individuals who made 'Robin of Sherwood' such a success. Any profit made will be donated to the estate of Richard 'Kip' Carpenter's chosen charity - The Sherwood Forest Trust. All guests at our events appear subject to work committments. We also maintain the right to refuse entry to any ticketed or non-ticketed fans, should we wish to do so. In the extremely unlikely event of cancellation, the Venue requires a percentage of their fee (as stated in their contract), dependent on the time-frame of cancellation. Once that has been paid, we would attempt to pay back ticket money from what is left (which will not be the full amount). Otherwise, tickets are non-refundable. You are more than welcome to sell tickets on if you are unable to attend, but you must notify us of the name change as well as providing a £10 Admin Fee. If you fail to do this, then the new ticket holder may be refused entry. For 'Child' tickets, proof of age may be requested before entry. Our venue is booked via a contract but if we have to change venues, for whatever reason, then we maintain the right to do so. We also maintain the right to change offers and exclusives, dependent on the budget of the convention. If you have taken out a Payment Plan, then it is YOUR responsibility to complete or cancel that plan. If you over-pay, we refuse the right to refund and if you under-pay we also refuse the right to refund (and, in some cases, will seek legal action to allow us the full amount of tickets you've been contracted for). If you sign the ticket contract, this acts as your legal document.